Currently in talks to acquire HMV, retail tycoon Mike Ashley has increased his presence in the UK retail market in the past five years; with 3.2% of all UK retail spend on non-food products going via one of the retailers that he has a significant stake in, in 2018, says GlobalData, a leading data and analytics company. 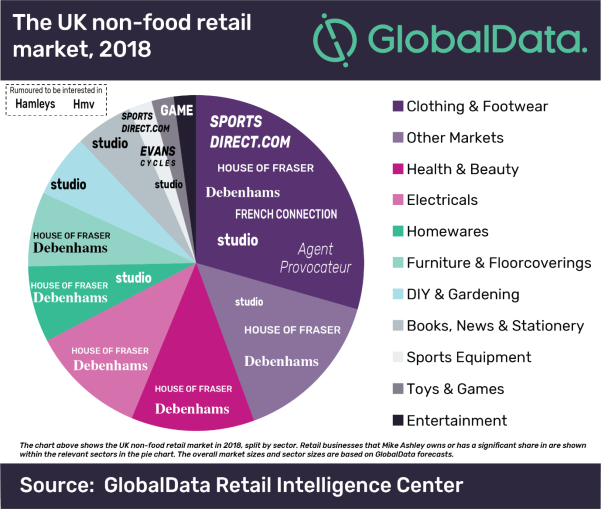 Sofie Willmott, Retail Analyst at GlobalData comments, “Mike Ashley has had a significant impact on the UK retail market in the past year, buying failing brands at a low price and aiming to turn their fortunes around. Given the well-known yet unrelated retailers that Ashley’s Sports Direct has purchased, it is unclear exactly what his long-term strategy is, but his growing group of brands will enable him to achieve economies of scale in terms of the supply chain, giving him greater buying power which will improve gross margins. However, the larger portfolio alone will not be enough to guarantee success and with consumer confidence expected to remain low while Brexit negotiations rumble on, Mike Ashley must quickly address the problems behind the retailers’ struggles in order to ensure they can become relevant once again to UK shoppers. Although Ashley has clearly focused on House of Fraser since Sports Direct bought it out of administration in August 2018 and has negotiated leases with landlords to ensure agreements are more viable, the product offer in stores appears to have been largely ignored so far. Since a number of brands pulled out of partnerships with the department store retailer following unpaid debts when it fell into administration, stores have been left looking empty and neglected.